For the people who are bored with trying to catch a fish sitting on the shore, spearfishing is the next fishing based adventure for you. However, it is not the safest sport out there. You will need the proper gear to safeguard yourself while underwater, for instance, gloves. So read on further, if you are interested in buying the best spearfishing gloves for yourself. Spearfishing can be a cold activity to pursue. The temperature of the water might not be warm all the time. For that, you need a pair of gloves that would be warm enough to keep your hands comfortable. There are many causes as to why you should choose to gloves during spearfishing. However, there are certain disadvantages as well. Gloves keep your hands warm. If you are inexperienced, gloves can make all the difference. Frozen hands react late, and this may end up in mishaps. They protect your hands as well. Undersea life consists of minuscule creatures that are often not visible. However, they do sting if they come into contact with your hands. As we are talking about fishing here, live fishes are slippery. Gloves meant for spearfishing have a non-slip grip that does not let the fish escape. Moreover, fishes have their defense mechanisms and may sting you with their fins. As harmless as it sounds, some of those fishes may be Gloves prevent this possibility. While you load your gun, your hands may be prone to further damage. Gloves protect your hands from that perspective as well. There cannot be many cons for gear that is meant to protect you. However, improper choice of gloves may cause you some difficulties, maybe even accidents. Gloves that are too thick may cut down on the dexterity. You won’t be able to react as swiftly if that is the case. Moreover, people new to the sport may have some difficulty in controlling the trigger while fishing. It is recommended to cut off the material from the top of the thumb to allow better control. Choose gloves that are more snug than comfortable. The material has a tendency to stretch a little when exposed to water. However, that does not mean that the gloves should almost choke your blood circulation. You don’t need to lose all sensations on your hands while underwater. Choosing Your Size: How to Measure? There is an easy way to find out the size of gloves you need. Take a measuring tape and measure the circumference of your hand beneath where the fingers join the palm. To do this, measure the hand that is dominant for you. 18 cm is the smallest and would require an XS size. On the other hand, you will require an XXL if your hands measure 30 cm. For women on the other hand, if your hand measures 15 cm, buy the XS size. And 23 cm will require the XXL size. To determine the length of your gloves, you need to measure your hand from the joint to the wrists to the tip of the middle finger. How Thick Should the Gloves Be? Along with being a comfortable size, you will need to ascertain the thickness of the gloves. The thickness determines how comfortable they feel on your hand. The dexterity of your hands is based on the thickness of the gloves as well. Moreover, they determine the warmth that is retained. Thus, the temperature of the hand should be a contributing factor in determining the thickness of your gloves. I usually buy gloves that are around 2.5 mm thick. Anything more than that is too clumsy. Below 2.5 mm, the hands turn numb from continuous exposure to the cold water. However, this measurement varies according to personal preference. So, choose gloves that you will feel comfortable in. 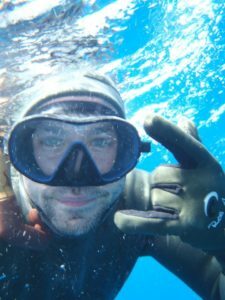 There are some factors that define spearfishing gloves. It is helpful if spearfishing gloves are waterproof on top of everything else. After all, their main purpose is protection from the water. The gloves should be durable as well. The stitching often unravels in gloves of inferior quality. So you should go for ones that will hold out against all the assault it is bound to be subjected to. Flexibility is a huge factor as well. Without flexibility, the stiff gloves will not allow you to position your hands as you need. This could be detrimental to your cause when you are trying to grip on to a fish. The gloves should be non-slip as well. The slippery fishes, being still alive, will struggle to escape. A non-slip material averts that incident to an extent. Finally, the gloves should be cut resistant too. A cut resistant pair should be able to protect your hands against the tiny abrasions in the water. It protects your hands against the fin or the teeth of the fish. Cressi is a well-known brand that specializes in diving instruments. It even branches out to snorkeling, spearfishing and swimming products. 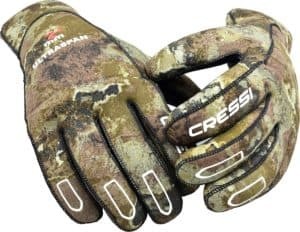 The Cressi Ultraspan is a pair of spearfishing gloves that can be further used for any underwater activities. This includes real diving, snorkeling, and even swimming. The thickness of the gloves is an ideal 2.5 mm. This should be perfect for waters that are not too cold. However, in case you prefer a thicker set, you can pick your preference from among the options. Preferably, if you are dealing with temperatures about 16 to 24 degree Celsius, gloves about 1 to 3 mm thick would be sufficient. For lower temperatures of 10 degrees or even less, you will need a thicker pair. In that case, I would suggest 5 to 7 mm. The material is a good barrier against any abrasions you may encounter underwater. You will also find that the gloves are anti-slip which is important for spearfishing. They are flexible which helps in maintaining the quickness of your hands. These take into account the minute details that helps the gloves fit in snugly. That includes the depth of your fingers and the circumference of the wrist. The stitch is meant to hold for a long time. Finally, the pair comes in camouflaged shades that help you to surprise your prey by blending in. 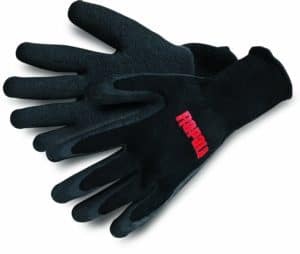 The Rapala Marine Gloves are a versatile pair that can survive an excursion into both fresh and salt water if required. With this, you can even take a dip into a river for a fishing experience. They are built with a durable latex material which serves the purpose of using gloves during spearfishing on multiple levels. The material gives the gloves a non-slip texture. This is important if you want to be successful during your fishing escapade. You would not want the fish to literally slip through your fingers after you have spent so much effort in getting hold of it. Moreover, it acts as a layer of protection for your hands. These also act as a barrier against teeth, the gill plates and more importantly, the dorsal fins of the fish, all of which cause harm to the bare or unprotected skin. After using, you simply need to put in the washer and then hang it to dry. There is little maintenance involved in this pair. And the most alluring aspect is the kind of features that are available for a price that is so reasonable. 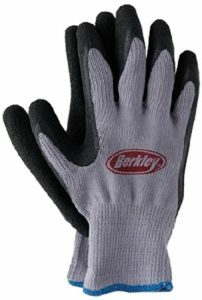 The Berkley Fishing Gloves are a pair that is primarily meant to grip on to slippery fishes. The material comes in a textured grip. This equips the gloves for better protection against any injuries that maybe caused due to struggling fishes. These injuries, while they sound laughable, can be dangerous. If the wound is too deep, the blood loss could land you in a hospital. Moreover, the grip is very flexible. This allows you to retain the dexterity in your hands. Some gloves can make your hands stiff, and you may not be able to position them as required. However, in spite of being flexible, these are a tough pair that certainly does its job in safeguarding you. You can use these as freely as you want without dreading the aftercare as this is a washable pair that is easy to maintain. Is a Spearfishing License Required in the U.S?